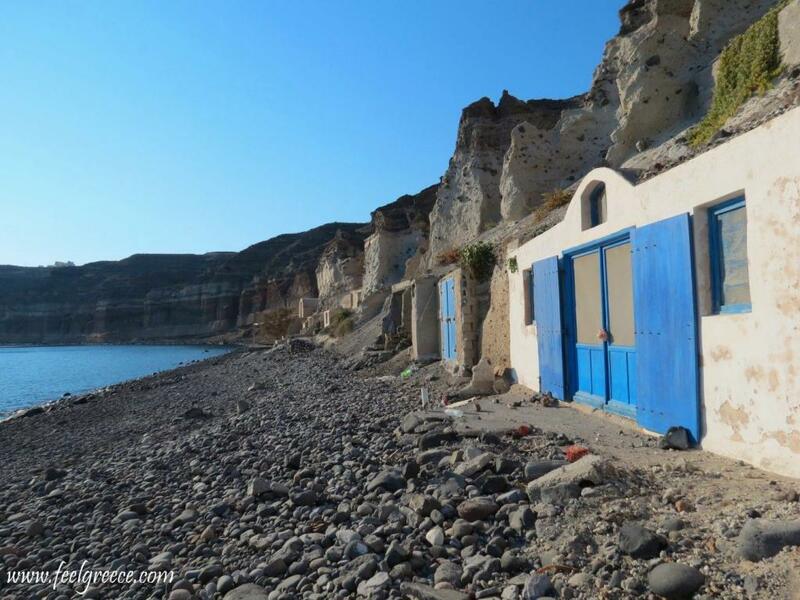 A few years ago, we really believed there were no beaches on Santorini. Just high cliffs, white houses and sunsets between the rocks. 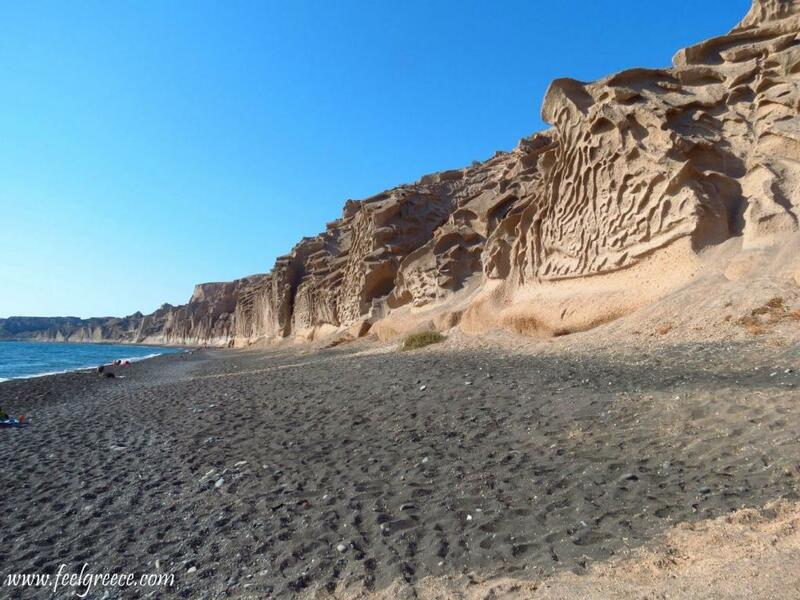 When we spontaneously decided to visit the island this September, we made a small research in advance and it turned out that compared to the high cliffs in the west, the east coast is barren, flat and… has sandy beaches with interesting rock volcanic formations. Some of the beaches even spread for kilometers and have colorful names like Black Beach, White beach, Red beach, etc. We’ll try to provide a short description of each of them through our look. 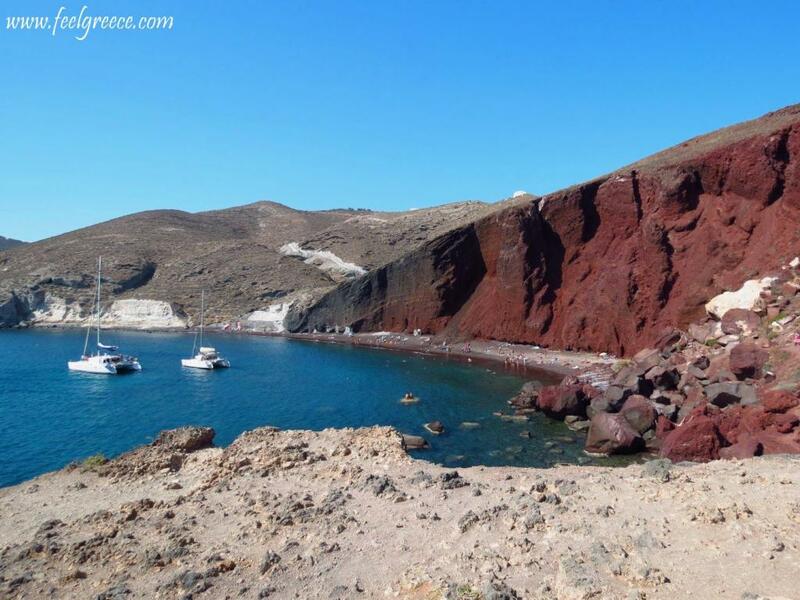 A narrow strip of red sand and pebbles under high red cliffs, this is the most famous beach on Santorini and, according to some sources, one of the 9 most colorful beaches in the world. The red color is due to the iron-rich rocks formed as a result of the violent volcanic activity in the past. From the parking lot you need to walk on a small path (red-colored again). Bring yourself comfortable shoes because the path is very uneven and flip-flops may be pierced by the rocks. The beach itself is interesting as you can’t see it anywhere else but its capacity is too small for the masses of people who come on foot or by boats. Out of season it may be better but then you won’t have the opportunity to swim. This is the beach of the resort of Kamari. 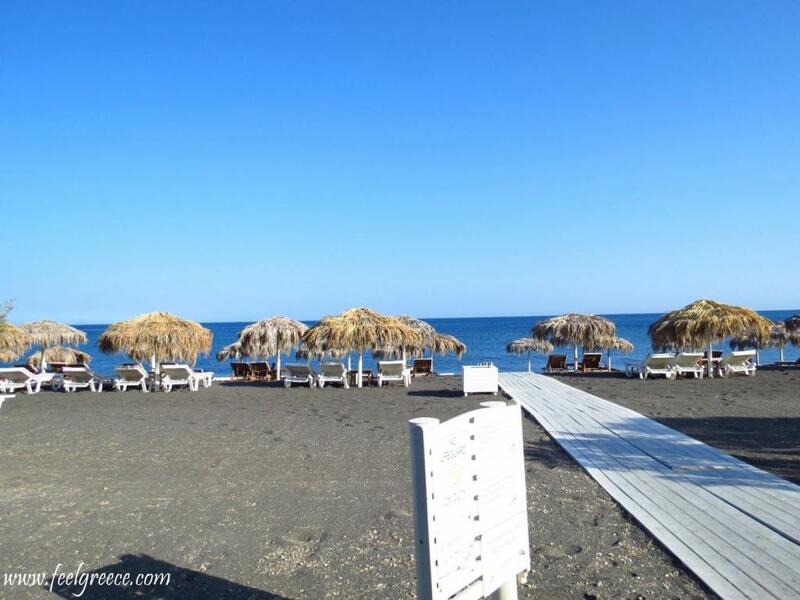 Black sand and numerous rows of sun loungers and umbrellas offered by the beach cafes and taverns. Most are paid (EUR 5-7 for a set) but some cafes offer them free of charge for clients. The beach is advertised as “suitable for families with children”, and the sea goes deep just a few meters from the shore, so, keep this in mind. The water was cold for September but it may be different in other periods. The huge rock with the Ancient Thira separates Kamari from the neighboring resort of Perissa but there is no road between them - in order to go to Perissa, you should first go back to Pyrgos. One can hardly tell where the border between these three is (and not only the beaches, but the resorts as well). 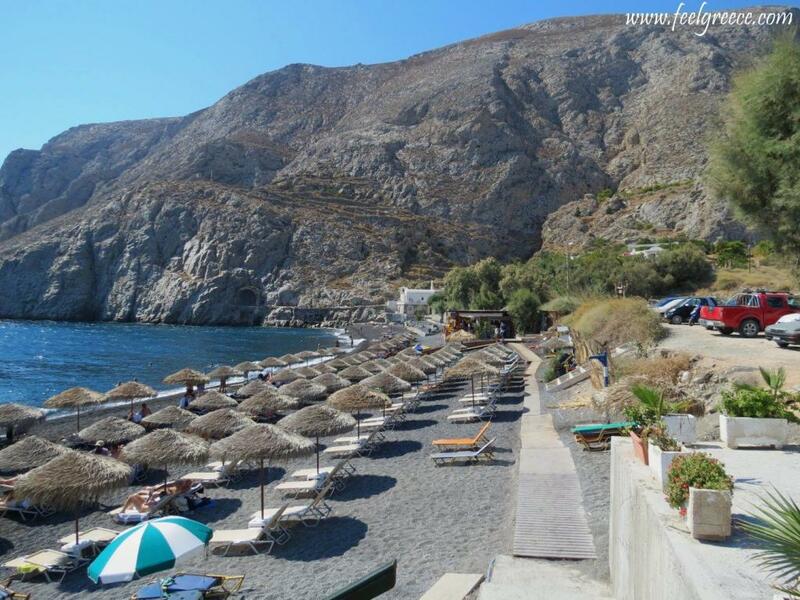 It is a long and wide beach with black sand and sometimes referred to as the Black beach, although most beaches of Santorini have black sand as well. One day we asked a local person which beach is better, Kamari or Perissa and he answered “None. The only difference is that when you are in Kamari, you see one side of the rock, and when you are in Perissa, you see the other side of the rock”. He was almost right and yet we found a difference which was in favor of the second one – space. The beach of Perissa is wider and the umbrellas are not so close to each other. And you don’t hear the conversation of the couple next lounger. If you are looking for beach bars, leisure and young people all around, go to Perivolos.Plenty of water sports available. We tried to find out where this beach ends and we couldn’t – it goes, and goes and goes…and we guess it reaches Vlychada. Also known as the Moon beach because the yellow rock formations here look weird and supernatural. There are only a few loungers available for a small charge but the beach is long and almost empty. The most distant part of it is often occupied by nudes. We didn’t know about this beach until we saw a signboard near Akrotiri. The road leading to Messa Pigadia is dirt but our car is used to driving on dirt roads of Greek islands so we had no doubt to go. By the way, the road is in a good condition and has no bumps. Since it was not popular like the other beaches, we expected an empty secluded cove with no people. It would be more secluded if there wasn’t a beach tavern there and yet it is a nice, quiet place. As we mentioned, Vlychada is the “moon beach” of the island but this one looks even stranger – white and red rocks showing the layers of the volcano and round stones instead of sand. Quaint rooms dug out in the rocks and mirror-smooth sea without waves. Liked it more than the famous Red beach no matter the stones. What is Retsina and where to find it?